The Lake Victoria sub-basin makes the headwater of the White Nile. 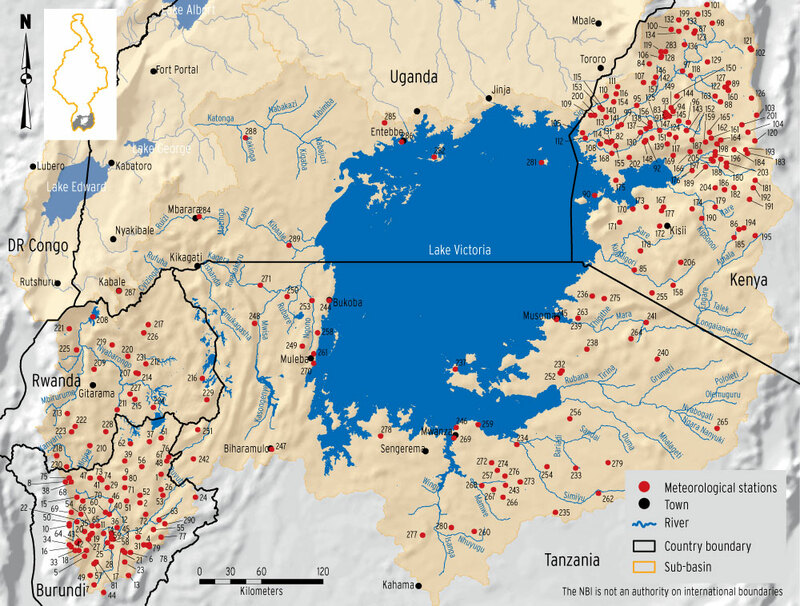 The Lake, with an area of about 68,000 km2 offers a major regulation to the flow of Victoria Nile. 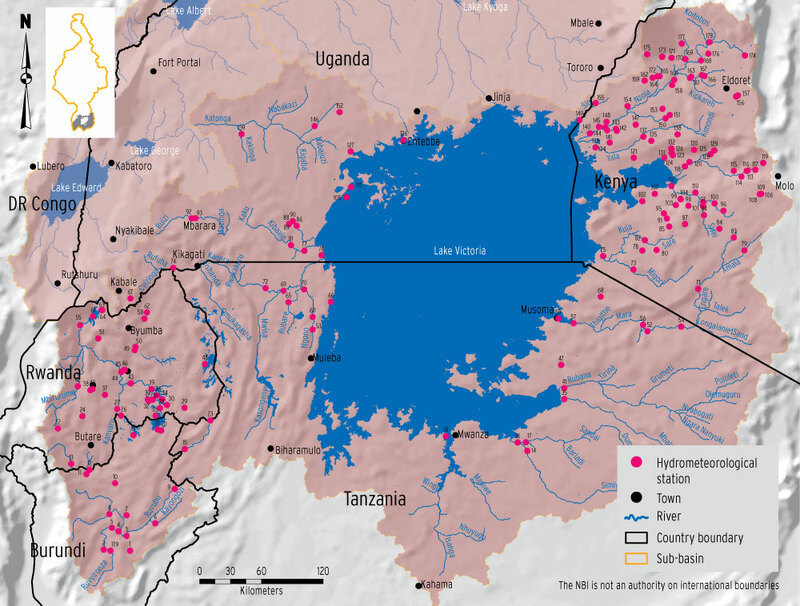 Major tributaries of the Lake include the Kagera (draining parts of Burundi, Rwanda and Tanzania), Mara (originating in Kenya), Nzoiya (Kenya) and Yala (Kenya). The lake, which is a source of water for users in three countries is also used widely for navigation. There are 254 meteorological stations in the sub-basin; distributed in Burundi (31), Kenya (124), Rwanda (34), Tanzania (42) and Uganda (23). The distribution of the stations is shown in the map below. 143 KAIMOSI TEA ESTATE LTD.
147 EREGI, ST. AUGUSTINE’S T.T.C. 150 MALAVA FOREST GUARD POST. 155 BARDING HARAMBEE SECONDARY SCH. 169 KIBOS COTTON EXPERIMENTAL STA. 188 MOMBWO SUGAR BELT CO. There are 158 hydrometric stations in the sub-basin; 14 in Burundi (in Kagera catchment), 87 in Kenya, 36 in Rwanda (Kagera catchment), seven in Tanzania and four in Uganda. The map below shows the location of the stations. The table adjacent to the map provides the list of hydrometric stations that were active at the time of the survey in 2014. Monitoring of water quality and lake water levels are two priority areas for strengthening the hydrometric monitoring system in the Lake Victoria Sub-basin. In the Kagera, sediment monitoring is a priority.